Ghetto, forced labor camp, concentration camp: All of the elements of the National Socialists’ policies of annihilation were to be found in Riga. 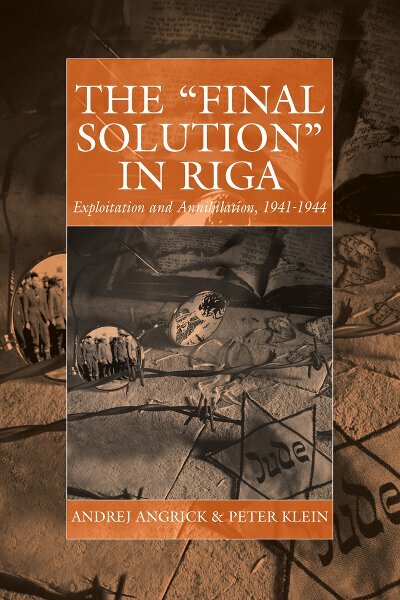 This first analysis of the Riga ghetto and the nearby camps of Salaspils and Jungfernhof addresses all aspects of German occupation policy during the Second World War. Drawing upon a broad array of sources that includes previously inaccessible Soviet archives, postwar criminal investigations, and trial records of alleged perpetrators, and the records of the Society of Survivors of the Riga Ghetto, the authors have produced an in-depth study of the Riga ghetto that never loses sight of the Latvian capital’s place within the overall design of Nazi policy and the all-of-Europe dimension of the Holocaust. Andrej Angrick, a native of Berlin, is a historian, consultant, and researcher affiliated with the Hamburg Foundation for the Promotion of Science and Culture. He has published numerous articles about the Holocaust in the Soviet Union and co-edited Der Dienstkalender Heinrich Himmlers 1941/42 (1999) and Die Gestapo nach 1945: Karrieren, Konflikte, Konstruktionen (with Klaus-Michael Mallmann, 2009), as well as Besatzungspolitik und Massenmord: Die Einsatzgruppe D in der südlichen Sowjetunion 1941–1943 (2003). Peter Klein, a Berlin-based historian, consultant, and researcher affiliated with the Hamburg Foundation for the Promotion of Science and Culture, has published widely on the Holocaust and German occupation in various parts of central and eastern Europe during the Second World War. Klein was the editor of Die Einsatzgruppen in der besetzten Sowjetunion 1941/1942 (1997) and a co-editor of Der Dienstkalender Heinrich Himmlers 1941/42 (1999). He is the author of “Gettoverwaltung Litzmannstadt” (2009). Ray Brandon is a freelance translator, historian, and researcher based in Berlin. A former editor at the Frankfurter Allgemeine Zeitung, English Edition, he is co-editor, with Wendy Lower, of The Shoah in Ukraine: History, Testimony, Memorialization.